Let us get something out of the way. Dead Congregation is really good as well as sort of important. 2008’s Graves of the Archangels was a giant leap for death metal in its slow climb up to contemporary prominence. 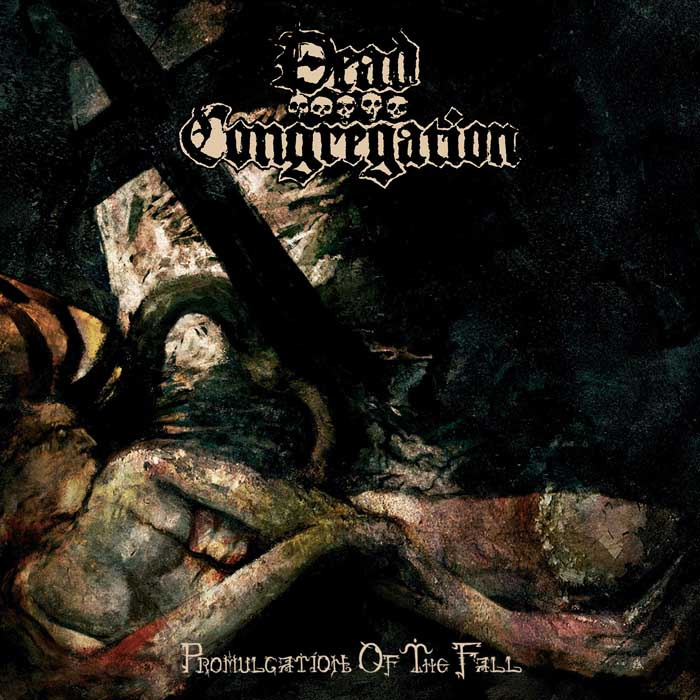 I am not saying anything at this moment but Dead Congregation was one of the first newer bands to receive its high profile in the contemporary death metal scene. 2008 was a long time ago and 6 years later, death metal has shaped out to be something of fanatic interest. Promulgation of the Fall comes at a different time as there are brilliant death metal records coming out on a more consistent basis. If Dead Congregation can secure another fantastic release, it would do wonders for their reputation. It would also cast the world in further gloom. I would like to state that Promulgation of the Fall is good not just because of the band’s small legacy among a certain group of death metal enthusiasts. Promulgation of the Fall is good because of its ability to take the death metal template and make it a monumental odyssey through caverns made of atmosphere and riffs. Though the band channels energy from Incantation, Immolation, and other 90’s death metal acts, Dead Congregation, as well its contemporaries, have graduated past any ties to past decades and are now just making music in a second wave. It is just as good of place to start as any. There is a deliberate slowness with Promulgation of the Fall which wasn’t present in Grave of the Archangels. The structural cohesiveness of the record is strengthened by the seamless track list which opens an almost endless landscape of rot and ruin. Though there are considerably less noticeable pinch harmonics in the new record, Promulgation of the Fall still retains a level of excitement and entertainment wrapped in a warm blanket of misery. The methodical rumination in songs like “Schisma” makes its final break into madness all the more vivid. Death metal is strange in the fact that it can pull in different directions and things like despair and destruction are wonderful when employed correctly and with calculation. Promulgation of the Fall stands among one of the better records of the year and its creators are ones who stand among a titans of the grave.